The Victorian Inn’s ‘Love Me, Love My Dog’ package invites guests to send pictures of their pets enjoying Monterey to pets@innsofmonterey.com. Each month the hotel’s staff picks one favorite Fido photo that best represents a dog’s life in Monterey. The winner receives a complimentary one-night stay at the Victorian Inn. Best of all, 10% of every ‘Love Me, Love My Dog’ package is donated to the SPCA for Monterey County. Our March winner is the adorable Angus who, according to parents Elizabeth and Duncan, never met a warm spot he didn’t like! Traveling with his own bed, this sweet pup, a West Highland White Terrier, curled up in front of the fireplace in his room at the Victorian Inn and made himself at home. According to Angus… “I will think of you each time I enjoy a drink from my beautiful water dish.” The water dish is one of the fun amenities that come with this package. Congratulations Elizabeth, Duncan and Angus! We look forward to welcoming you back to the Victorian Inn. Interested in taking advantage of Monterey’s pet friendly ways? Our ‘Love Me, Love My Dog’ package includes cozy, specially designed accommodations for two humans and one dog, souvenir water bowl, tail wagging doggie snacks, a beach toy and – for the pet owners – continental breakfast buffet and an evening wine and cheese reception. 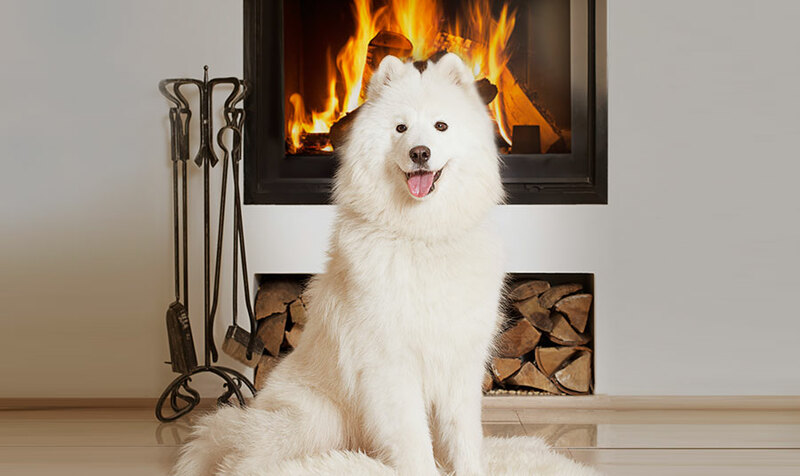 Each room has a fireplace – the perfect place for your pooch to curl up and nap. This one-night package is $129 per night, not including taxes and gratuity. For reservations and information, please visit www.victorianinn.com or call 800-232-4141. And be sure to send us a picture (no altered images please; just send the original!) of your four legged friend enjoying Monterey- you may be next month’s winner! With its wide-open, pet perfect beaches, extensive oceanfront walking paths and dog-friendly attitude, Monterey is a terrific getaway, the epitome of a dog’s life.